What is it that makes the north and the south (or the east and the west) of a city or country so different? And then makes these people have different labels? I am from northern Italy so those from the south call me polentona (polenta eater). This means I eat polenta. This isn’t such a bad thing. In fact it is a good thing. I love polenta. I remember when I was growing up and mamma would make a great wobbly slab of yellow polenta to eat with a delicious sauce. It was a hearty winter dish. Yes we were proud polenta eaters! Polenta is made from corn which grows really well in the Veneto region of Italy. You can buy yellow or white polenta. It can be milled to be very fine (and even used in cake making) but the coarser variety is ideal for polenta. Don’t buy the instant polenta or the ready made one – the regular type is very easy to make. It is worth the effort. It takes about 30 minutes and you only need to stir it every now and then. The secret is the addition of butter and grated parmigiano cheese at the end. Creamy, soft and wet…it is delightful with most hearty meat, chicken or fish dishes which have a rich sauce. It goes beautifully with braised mushrooms as well. Last week Mark was away for work all week and I wanted to make him a welcome home dinner that would warm him when he returned to chilly Melbourne. I made beef braised with red wine – in fact a whole bottle of wine. You can use a cheaper cut of meat like gravy beef if you like. As it is a slow cooked dish, the beef becomes so tender that it melts in your mouth – literally. If you add this to creamy polenta, it makes a perfect slow dinner for a cold late autumn night. We had this meal last night with a glass (or two) of red Nebbiolo wine. I think Mark really enjoyed being back home! Toss the cubed beef in flour. Melt the butter in a large frypan and braise the beef on medium heat in batches until it is browned on all sides (4-5 minutes). Put the cooked beef in a large heavy bottomed casserole dish to one side. Cook the shallots, garlic and pancetta in the fry pan (you might need to add a bit more butter). Cook at low heat for around 8 minutes. Remove the shallots, garlic and cooked pancetta and add to the casserole dish with the beef. Deglaze the fry pan with a glass of the red wine to remove all the cooked residue and add it all to the casserole. Place the casserole dish on a hotplate at medium heat. 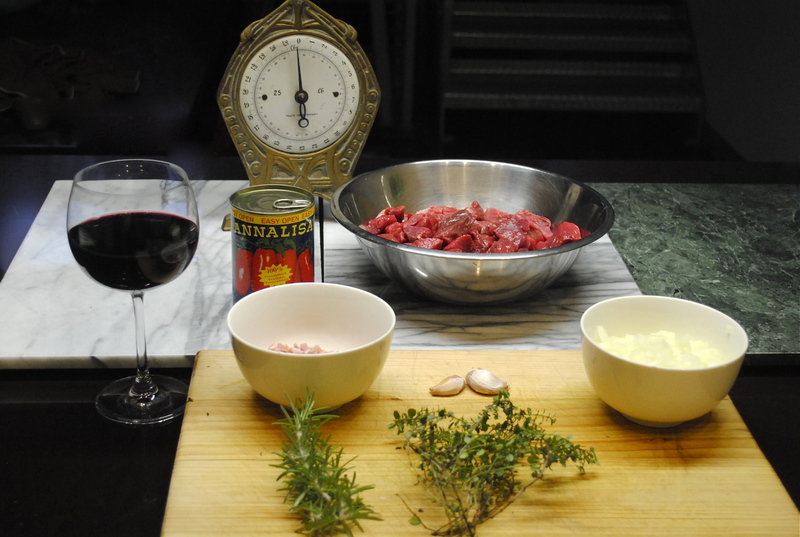 Add the rest of the wine, the entire contents of the tin of tomatoes, the tomato paste and the herbs. Break up the tomatoes a bit with a wooden spoon in the pan. Once it starts simmering, turn the heat to low and cover. It will take around 2 hours to cook – it is cooked until the meat is very tender. You will need to stir it every now and then to make sure it does not stick to the bottom of the pan. Remember to remove the twigs of rosemary and thyme before serving. To make the polenta – heat the water in a large non stick saucepan until it is at a rolling boil. Drizzle the polenta in a slow even stream, stirring all the while with a wooden spoon. Once all the polenta is incorporated, stir it for a few more minutes. After that, stir it twice every 3-4 minutes. Have some boiling water in the kettle on the side, you will need to add a bit more as you go. It should be like a thick grainy custard throughout the cooking process, so add enough boiling water to ensure it stays at this consistency. It is ready after about half an hour – you don’t need to be very precise with the timing. At this point add the butter and stir it in until melted. Remove the pot from the heat and stir in the finely grated parmigiano until that has melted. Spoon the polenta into individual pasta bowls. Make a well in the centre and spoon the cooked beef into this. Make sure there is lots of rich sauce. You can decorate each serve with a tiny sprig of fresh thyme if you like. Pour yourself a glass of wine, make sure you are in a nice warm place and eat. Buon appetito! I love being a polentona! Great Leese! Let me know how you get on with it ? I just finished eating a plate of your wonderful Polenta with Braised Beef in Red Wine – fantastico! Grazie. I’m also proud to be a Polentone! I am so glad you enjoyed it Matthew. What part of Italy are you from (apart from the north)? A tiny town on the Veneto plain, in between Bassano Del Grappa and Asolo. I’m sure that all the inhabitants of Castelcucco would approve of your recipe! Yes it’s a wonderful little town but then again aren’t they all! Bassano and Asolo in particular are breathtaking. One thing that surprised me about your recipe was that you didn’t include carrot and celery. The smell of carrot, celery and onion always reminds me of my Zia Maria’s soffritto cooking on her wood fired stove. 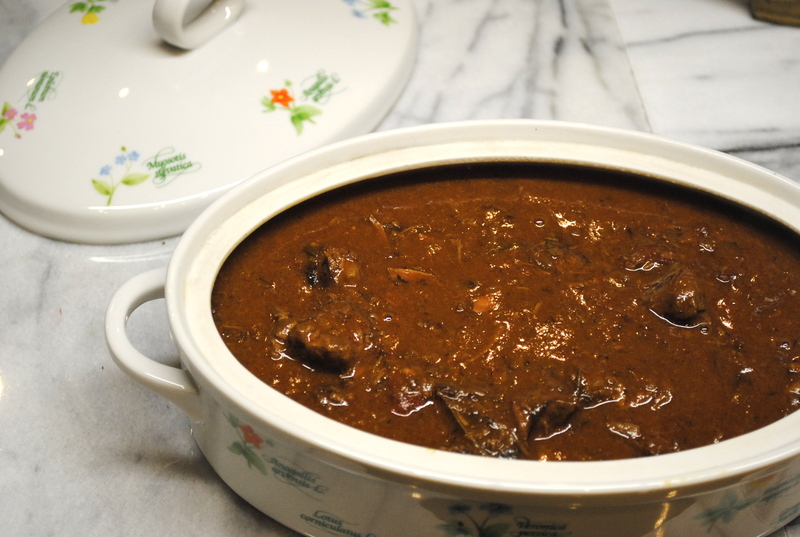 I love anything made with soffritto – what a great memory your zia Maria has given you, cooking on the “fogolar”. There is no soffritto in this recipe – I guess the pancetta fills the gap. However food is about experimenting! !